Monday was my birthday. Dan spoiled me! First, I woke up to a yummy breakfast in bed! The boy went to the store early in the morning because he did not know where I keep the ingredients he would need. He also bought another waffle iron...just in case. So now we have two huge boxes of Bisquick, lots of syrup, two waffle irons, 2 dozen eggs, and about 4 boxes of butter (I recently stocked up when they were on sale at Smith's. Anyway, it was a lovely surprise! Next, we got ready for a day of fun and then took little Sophie to my mom's house so we could enjoy a date for just the two of us! 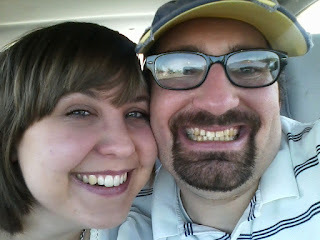 So, we went to the movies...we saw This Means War which was actually kind of funny. 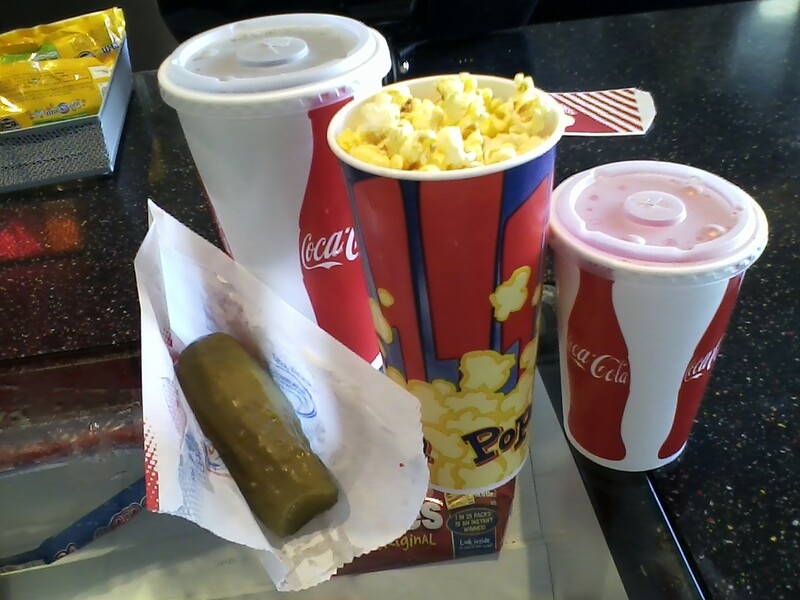 We even got movie treats which we NEVER do! After we ate, we decided that we HAD to enjoy the absolutely beautiful weather outside so we ventured out for a little walk about Willard. Sophie preferes to sit on Dan's shoulder's and pull on his ear rather than sit in the stroller. When we woke up, Dan said "hey lets go to Olive Garden" I said, "No thanks, I just want to stay in tonight" He said "it is your birthday, we are going to Olive Garden" I said "yes, sir!" Guess who was waiting for us at Olive Garden? A few of my favorite people...Meg, Riley and little Owen and Riley and Kae (and my new little neice in her belly) Anyway, I am sure glad that my man Dan forced me to go to the OG becuase it was a fun night all around! Thanks guys!!! Love you! It was pretty much the best brithday EVER! Sounds like it was the perfect birthday; wow. Ha ha about all your pancake supplies. Sounds like you need a Pancakes & Pajamas Party at your house! 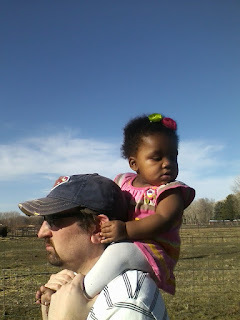 And Sophie is so darn cute sitting on Daddy's shoulders.